Acquainting with the music of Jarrod Dickenson has been an intermittent activity over the last couple of years, but it can gladly be reported that appreciation is rocketing up the scale. 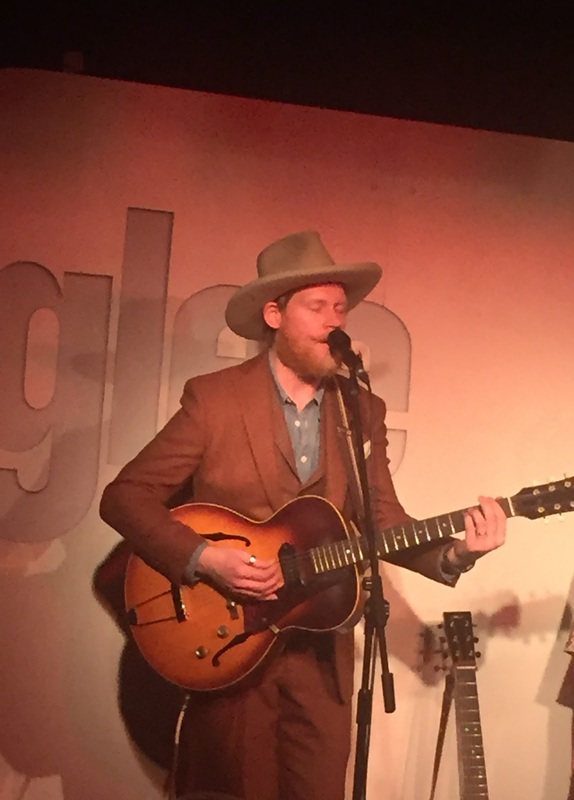 After catching Jarrod play support shows in Birmingham for John Fulbright and Diana Jones in 2014 and 2015 respectively, this year he has made a return to the Glee Club to headline a date. Of course one of the biggest steps that helped attract a highly credible number of punters this evening was the support shows he played with his band for The Waterboys towards the back end of last year including a sold out date at the Symphony Hall. Reports from that performance were extremely complementary, and although the funds weren’t sufficient enough to bring the band back for this latest tour, there was a marked degree of increasing assurance in how Jarrod presented his music. Headlining a show does raise the bar for an artist and Jarrod is equipped with the songs, voice, sound and banter to convey the necessary confidence. 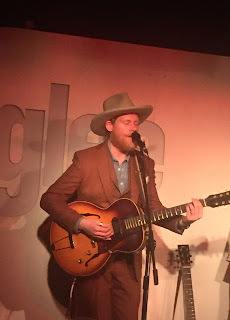 For this tour, the New York based Texan was accompanied by his wife Claire on additional vocals and invited fellow Big Apple resident Cariad Harmon to play a few tunes to open each show. The evening was rolled out as a collaborative affair with Jarrod introducing Cariad when the show began and she returned the compliment by asking him and Claire to join her for one song. To complete the cosy arrangements, Jarrod invited both Cariad and fellow artist David Ford, who was in the audience, to join a crowded stage for the encore number. By this time the paying audience had their modest outlay repaid several times over with respect to the entertainment provided. Cariad introduced herself as a Brit originally from London living in New York for the last twelve years. Balancing her opening set between a mixture of goofy love encounter songs and ones which paid the rent, she rose to the occasion with a spritely performance suggesting she had played many a choppier water than this Glee Club gathering. She was reliant on the content of her songs to polish her style and these successfully held the attention for the half hour in the spotlight. Cariad was honoured that Jarrod asked her to tour with him and to return to her homeland for the first time in four and a half years. What followed was an exhibition by Jarrod in how to evolve from an opener to the fully fledged main act. For around an hour and ten minutes, the striking poise of Jarrod held court armed with the essential tools of a performing singer-songwriter. The rotation of a pair of contrasting guitars exuded a clear crisp sound which also warrants praise in the direction of the venue’s sound team. Without courting too many labels, Jarrod does skirt around the folk, country and blues genres, but essentially is a smart performer with a keen ear on a good tune and a talent to convey his thoughts into lyrical content. From the moment he took to the stage, the audience was offered exclusive attention as he paraded a diverse set featuring songs from his past releases, ones from his currently being mastered new album and the occasional choice-cover. The latter came in the guise of a splendid version of the Tom Waits song ‘Picture in a Frame’. Essentially it is Jarrod’s own songs that form his artistic credibility with ‘California’ and ‘No Work for a Working Man’ impressing in the early stages, ‘Rosalie’ shoring up the middle section, followed by ‘In the Meantime’ and ‘Little Black Dress’ flavouring the closing moments. Perhaps the pick of the evening was ‘Your Heart Belongs to Me’ where wife Claire stepped out of the harmony shadows to beautifully sing a verse suggesting there is more potential to evolve as a performing couple. The titles of the other songs are a little sketchy but Jarrod’s attempt to step into Texas cowboy music paid off along with a number he wrote with David Ford about the evils of financial greed. While the fine details often hold importance, there is much merit in reflecting on the impression left by an artist and the aura they create while on stage. On both of these accounts, Jarrod scored high with an impeding hope that he can one day return to play headline shows with his full band. However life is sometimes just about the present and the practical. 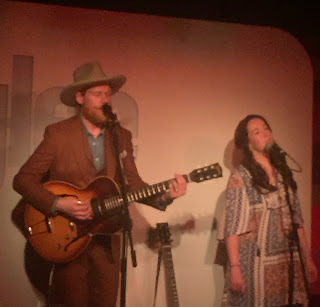 On that final point it is worth commending Cariad, Claire and Jarrod Dickenson for providing a highly enjoyable evening of entertainment and ensuring the art of the fine song is still king.